It is the top of the season for new listings in Tallahassee, as traditionally more home sellers put their home on the market now than during any other time of year. When we look at the graph on the right, it appears as if more sellers are testing the market this year than did last year, perhaps signaling a turn in the confidence of homeowners that they will be able to sell a home in 2013. We like to track all listings over $100,000, as it removes the majority of investment properties from the data and often times provides deeper insight into the residential market trends. If you would like to search all new listings in Tallahassee that are currently still for sale, then check out a cool property search tool for new listings in Tallahassee (all properties that are under contract or sold have been removed). The tool even provides a CPI index (Comparative Price Indicator) which gauges how well the property is priced compared to its competition. 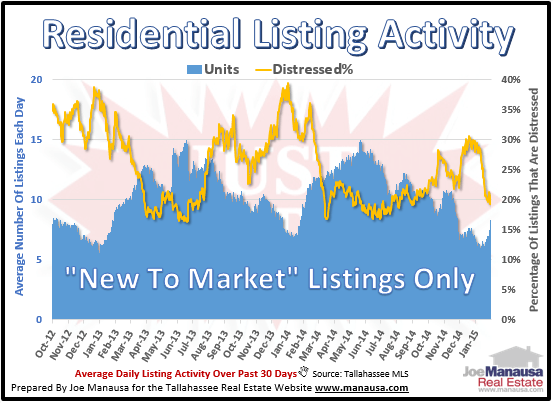 In the real estate graph below, we look at all new listings in Tallahassee each day, priced from $100,000 and up, and notice a short term trend has emerged. In the graph above, the green line measures the average asking price of new Tallahassee home listings (30 day average price) while the brown line shows the ratio of distressed properties (short sales, foreclosures, and bank owned properties) in the market for homes priced above $100,000. Lately, it appears as if more discretionary home sellers are trying the market, thus the ratio of distressed properties is half of what it was at the end of 2012. I'll be curious to see how this unfolds during the rest of the spring listing season. The following table shows all new Tallahassee home listings (priced above $100,000) this year. Please note you can put something in the "search box" if there is a particular neighborhood or street that you want to see. I hope you enjoyed our report on new listings in Tallahassee, please drop me a note if you would like to know how we can apply our market information to helping you buy or sell a home.